Family Father was a talented but not-too-successful carpenter who moved the family around frequently. to work as an office boy and printer's assistant. Travel Never went to Europe. Born to a line of ministers. Encouraged by a brilliant, eccentric aunt. Went to Harvard, as did his father and fellow Transcendentalist Thoreau. Starts teaching grade school on Long Island in 1836; Southold incident in 1840. Never married; buys a "cheap lot" in Camden in 1874 (for $450). Served as a schoolmaster then pastor of Boston's Second Church (Cotton Mather preceded him). After settling in Concord, started receiving his wife's legacy. Never a part of New York society or any group of poets. Most importantly, interacted with a group of artists. Emerson, Thoreau, Hawthorne, and others formed core of Transcendentalist movement. writer had perhaps elevated himself to the status of a prophet, his run-on sentences, breathless lists, and general disregard for proper punctuation suggested that he was not a trained or "proper" writer. Ralph Waldo Emerson (1803-1882) was born into very privileged social, economic and intellectual beginnings. Whitman inherited no such privilege. Whitman's father was a liberal-thinking carpenter who failed in business (and was possibly an alcoholic). Out of the seven siblings who survived childhood, Jesse would lose his mind and die in an insane asylum; Hanna Louisa would become neurotic and possibly psychotic; Andrew was an alcoholic who died young, forcing his wife to become a streetwalker; Edward was retarded at birth, partly crippled, and possibly epileptic. Whitman suffered from a lack of schooling (about five years in District School #1, the only public school in Brooklyn). Think of Emerson and Thoreau preparing at Harvard, Poe at the University of Virginia, Wordsworth at Cambridge, and even Dickinson at Holyoke. Whitman was self-taught, reading Shakespeare, the Bible, Homer, and Dante on his own time. His mother could barely write, and his father died around the same time that Leaves of Grass first came out. Unlike his peer Emerson, Whitman had a background in journalism. What did he write before 1855? Only nineteen poems and twenty-four pieces of fiction—but countless pieces of journalism. Whitman was not part of any group of artists like the Transcendentalists. There were other writers in New York—Herman Melville, born the same year, and Edgar Allen Poe—but there was no community between them. Whitman was on his own, and also an urban poet, so the city was his community. "I was simmering, simmering, simmering ... Emerson brought me to a boil," Whitman told John Trowbridge during the Civil War. Emerson had called upon American writers to strike an original relation to the universe beginning in the 1840s, and certainly Whitman knew of Emerson during this "seed-time" of Leaves of Grass. He even reported on Emerson's New York lectures for the newspapers, the New York Aurora and the Brooklyn Daily Eagle. Emerson's essay "The Poet," published in 1844, seems a perfect job description for Walt Whitman as the new American bard. "Our logrolling, our stumps and their politics, our fisheries, our Negroes, and Indians, our boasts, and our repudiations, the wrath of rogues, and the pusillanimity of honest men, the northern trade, the southern planting, the western clearing, Oregon, and Texas, are yet unsung." Whitman seems to respond directly to this call for an American poet, and Emerson seemed to approve: "I greet you at the beginning of a great career, which yet must have had a long foreground somewhere, for such a start,"
Emerson wrote to Whitman a few weeks after the first publication of Leaves of Grass. Whitman was so pleased with the letter that he included it in the 1856 edition of Leaves of Grass as promotional material, going so far as to imprint the first words on the spine of the book. Whitman also pulls away from Emerson as evidenced in Whitman's melding of the spiritual and physical—and his glorification of banality and in his radical and subversive messages. 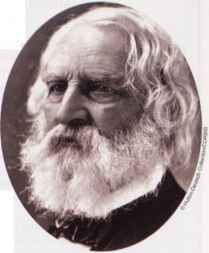 While Leaves of Graves was far from a success in its initial publication, "Hiawatha" was the big seller in 1855 and made Henry Wadsworth Longfellow quite a bit of money. The poem has a regulated rhythm and predictable forms using a European model called the Kalevala. But was it really what people wanted to hear? It imposed values and beliefs on a nation (even Hiawatha's wish to go "west"). There was also a lack of connection between poet and reader—the poet is telling a story but isn't really "present." Think about the differences between Longfellow's "Hiawatha" and Whitman's "Song of Myself." "Song of Myself places an emphasis on nature and organic qualities (of the free, "stream of consciousness" verse itself; of the poet's attitude toward personal or "taboo" subject matter). It provides a sense of intimacy between poet and reader. Whitman expresses a democratic understanding of an individual's importance in a group balance and between the demands of one person and the mass. There is a new "rough simplicity" of style and ideas and unconventional uses of sound, rhythm, and sense to transport readers. Are there any similarities between the two? In fact there are a few. • Both pieces are long poems.